A couple days ago I made some predictions about today’s announcement. Lets look at my predictions and see how accurate they were. 1. iOS 6 (I know big shocker) Included here, however is any new additions to iCloud functionality that will be announced for the rest of this year. Like a new streaming service, etc, et. al. This was a gimme. iOS6 was previewed at WWDC this year. So, I counting it as right. There were many enhancements to the OS. I do not recall seeing a streaming service. +1 if you are counting. New iPhone; Check. The sixth generation of the phone is the named iPhone 5. So, +1, -1. New iPod Touch! last year’s model is the same price, and this years is $199? Really? Bonus Points: I do not think there will be an announcement of a the so called “iPad mini” or a full blown tv unless it is a teaser. Unless Tim Cook says “One more thing.” I do not expect to see a new product from Apple. I think if they mention a new product it will be to direct attention to a product specific launch event. Further, I don’t think we see an “iPad mini” until we see the next generation of iPad. I don’t think we see an full grown tv until Apple can revolutionize content delivery. But, I’m also secretly hoping that I am wrong. I am excited about the new apple products. I can’t wait to see them in person. Can you say evaluation unit, Apple? 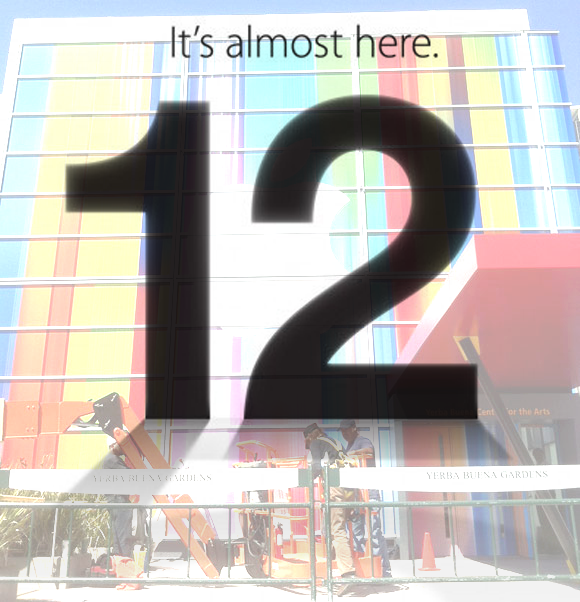 The invatation from Apple says “it’s almost here.”The Yerba Buena center in San Francisco is decorated. The big announcement from Apple will take place on Wednesday. So, I’ll take a stab at predicting what we will see on stage. Using the invatation and the Yerba Buena center’s decorations a guide I think we’ll see 5 things, and they are all iOS. iOS 6 (I know big shocker) Included here, however is any new additions to iCloud functionality that will be announced for the rest of this year. Like a new streaming service, etc, et. al. I do not think there will be an announcement of a the so called “iPad mini” or a full blown tv unless it is a teaser. Unless Tim Cook says “One more thing.” I do not expect to see a new product from Apple. I think if they mention a new product it will be to direct attention to a product specific launch event. Further, I don’t think we see an “iPad mini” until we see the next generation of iPad. I don’t think we see an full grown tv until Apple can revolutionize content delivery. But, I’m also secretly hoping that I am wrong. I’ll post post an update after the announcement to see just how accurate I was. I’m trying IFTTT. Looks promising. I’m trying If This Then That. It is a service that automates actions online using a simple if this then that logic. For example: if I post to instagram then image shows up here(that). It works in the background to do predetermined things. I doubt we will use it to post all of our My Instagram pictures here on our website. But, it is still rather neat.